More than 75 people gathered last Thursday for Protecting Women’s Rights: International Law & Advocacy, a full-day conference for advocates and lawyers organized by the International Justice Resource Center (IJRC). 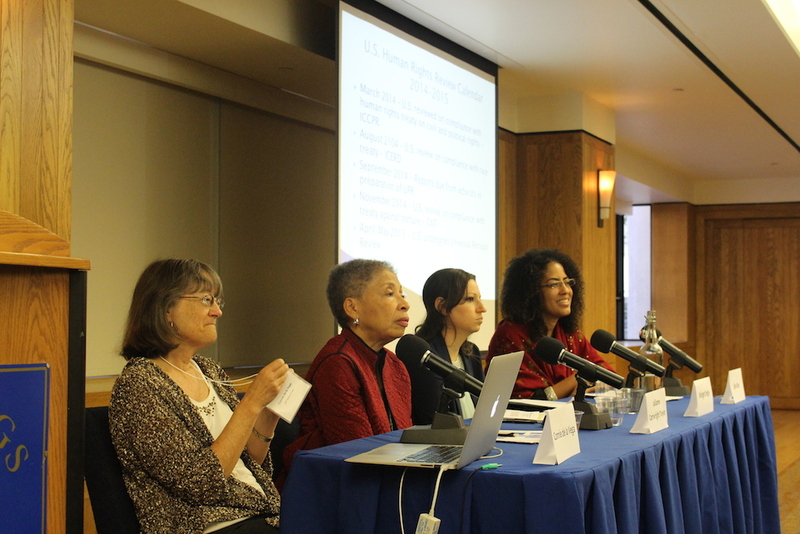 The training, held at the University of California, Hastings College of the Law in San Francisco, featured some of the most distinguished human rights and women’s rights practitioners in the world speaking on a variety of topics, including international and regional human rights mechanisms, violence against women, gender discrimination, and sexual and reproductive rights. Though the discussion covered a range of advocacy strategies and women’s rights issues, speakers and participants underscored six key insights relevant to women’s rights defenders in the United States and around the world. See the agenda and speakers’ bios for additional details, and visit the online supplementary materials folder (bit.ly/womensrights2014) to view selected treaties, publications, and other documents related to the topics addressed. IJRC thanks the Center for Gender & Refugee Studies, Human Rights Advocates, International Action Network for Gender Equity & Law, San Francisco Department on the Status of Women, and US Human Rights Network for their co-sponsorship of this event. Engaging with the human rights framework can elevate local, specific debates around policies and practices that impact women by revealing and reframing these issues as human rights concerns. 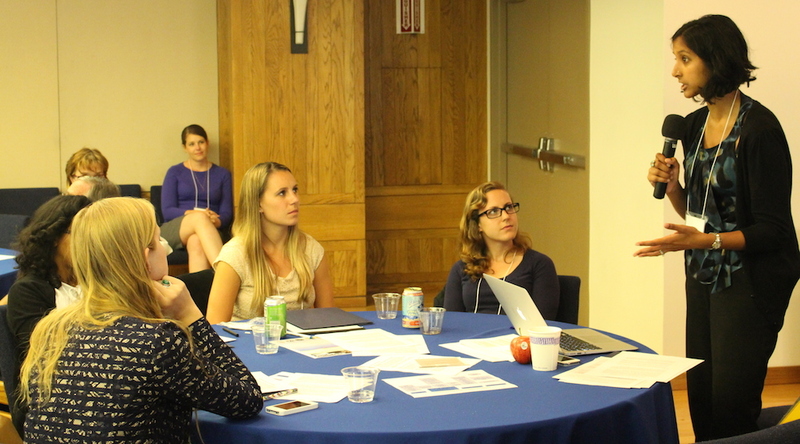 Whether dealing with gender-based harassment on public transportation, the conditions of paid and unpaid home care work, enforcement of public nuisance laws against domestic violence victims, the shackling of pregnant women in immigration detention, access to reproductive healthcare, or any number of other women’s rights issues, using human rights advocacy strategies has proved powerful in transforming local, isolated debates on questions of policy preference or resource allocation into broader discussions centered on government’s obligations to ensure women’s equal enjoyment of fundamental freedoms. International human rights law provides diverse advantages in efforts to advance and protect women’s fundamental rights. Human rights protections, for example, are often stronger than national, state, or local laws. Referencing human rights standards can also lend moral authority to arguments in favor of women’s rights and help shift public and policymaker perspectives in a way that reveals the humanity and human dignity of people affected by rights abuses. Using the human rights framework can help advocate for a change in specific laws or practices, not just because it is desired by some individuals or would benefit a certain group, but because it is necessary to preserve women’s human rights. Participants debate the human rights implications of harassment and violence against women on public transportation. 2. Ratification: At Any Cost? In many countries, advocates have long focused on securing their governments’ ratification of key international human rights treaties, but – participants asked – at what cost? With States’ common use of reservations, understandings, and declarations (“RUDs”) to introduce purported caveats or exceptions to their human rights obligations, should ratification always be a priority? Those working for the rights of women and girls in the United States have been frustrated by the U.S. government’s failure to ratify the Convention on the Elimination of All Forms of Discrimination Against Women (CEDAW) and the Convention on the Rights of the Child. Some speakers and participants asserted that what matters most is the language of domestic implementation, and not that the State is party to an international agreement. Human rights standards and language can be incorporated into advocacy and policymaking even in the absence of State ratification. And, some organizations in the United States have decided not to pursue ratification where potential RUDs may undermine full respect and recognition of individuals’ rights. As a counter example, however, Connie de la Vega pointed to efforts to end use of the juvenile death penalty in the United States. She explained that the United States’ reservation to the International Covenant on Civil and Political Rights (ICCPR), preserving its authority to impose capital punishment on juveniles did not prevent the Supreme Court from later prohibiting this practice – citing international standards, including the ICCPR, in support of its finding that international consensus was clearly against the juvenile death penalty. See Roper v. Simmons, 543 U.S. 551 (2005). Connie de la Vega, Julianne Cartwright Traylor, Bridget Engle, and Ejim Dike take questions from participants. As human rights advocates know, securing a favorable decision or recommendation concerning a specific human rights violation is only part of the battle. Bringing about real accountability and reform means ensuring that the responsible governmental entities take the steps necessary to implement that decision or recommendation. In the absence of robust enforcement mechanisms at the international level, this work generally falls to victims and advocates. For many skeptics, this is just one reason to view international human rights standards as merely aspirational, rather than legally binding. However, several speakers on June 19 emphasized that implementation, or enforcement, of human rights victories is similar to many other scenarios. They pointed to resistance to the U.S. Supreme Court’s decisions in Brown v. Board of Education cases, mandating the racial desegregation of public schools “with all deliberate speed.” While putting an end to racial segregation in American schools was, and continues to be, a monumental effort requiring a coordinated civil society and sustained advocacy before all branches of government, those landmark judgments have enormous significance, legally, socially, and morally. Another speaker likened the struggle for human rights implementation to a tenant enforcing a judgment against his landlord for return of a security deposit. The tenant may have a judicial order in hand, but will nonetheless often have to expend considerable time and energy – and work with a variety of other entities – to get his money back. In this sense, advocacy based on international human rights law mirrors advocacy based on Constitutional or other domestic standards. 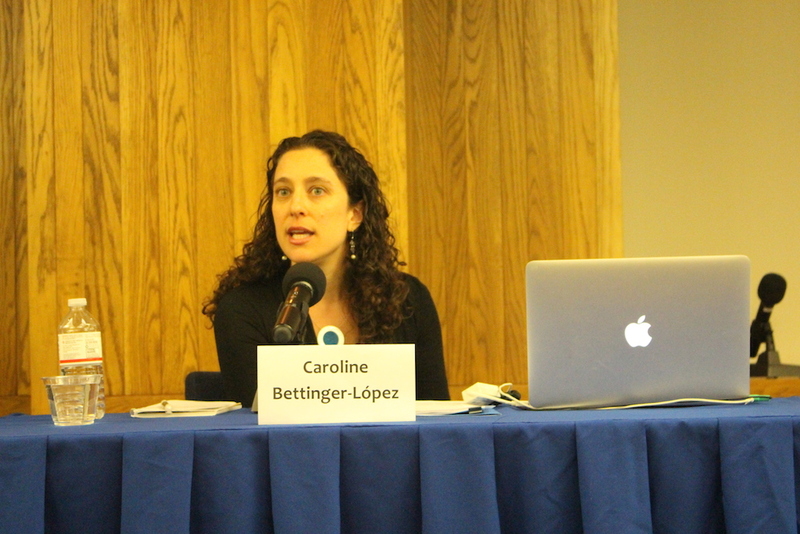 For example, Carrie Bettinger-López described ongoing efforts with local and federal officials to increase awareness of the gaps in protection for victims of domestic violence and to change policing practices, as part of implementing the Inter-American Commission on Human Rights’ decision in the case of Jessica Lenahan (Gonzales), who prevailed in her complaint against the United States concerning a local police department’s failure to enforce a restraining order against her abuser, resulting in the deaths of her daughters. Caroline Bettinger-López provides insights into the Jessica Lenahan (Gonzales) case. Where national ratification is unlikely or would be weakened by RUDs, or when States point to federalism as an obstacle to implementing human rights bodies’ recommendations, advocates should consider the benefits of local governments’ adoption of human rights standards. A much-cited example of local implementation is San Francisco’s adoption of an ordinance reflecting the principles of the Convention on the Elimination of All Forms of Discrimination against Women (CEDAW). Through the Cities for CEDAW initiative, several other U.S. cities and states have overcome the failure of the U.S. to ratify CEDAW by adopting their own legally binding ordinances. Speaker Carrie Bettinger-López gave another example of cities and counties across the United States adopting resolutions recognizing freedom from domestic violence as a human right and referencing the Inter-American Commission on Human Rights’ decision in the Jessica Lenahan (Gonzales) case. 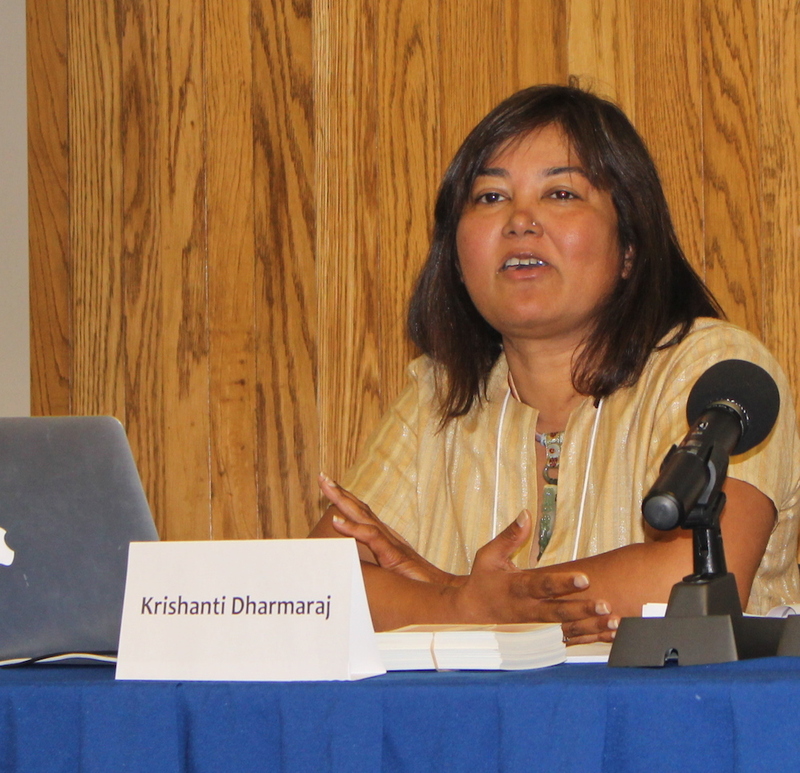 Krishanti Dharmaraj explains the ways in which international human rights law addresses multiple discrimination against women, and provides a summary of San Francisco’s local implementation of CEDAW. A recurrent topic of discussion was the importance of intersectionality in any conversation about women’s rights and violations of those rights. The speakers emphasized that women are not a homogeneous group, and discrimination against them must be considered in light of all aspects of their identities, including race, sexual orientation, gender identity, class, and physical ability. Women may experience different treatment and human rights violations as a result of any one of these characteristics or memberships, making women of color and those who belong to minority or marginalized communities more vulnerable to rights abuses. In order to eradicate gender discrimination, it is necessary to be cognizant of and proactively fight against other forms of discrimination, as well. 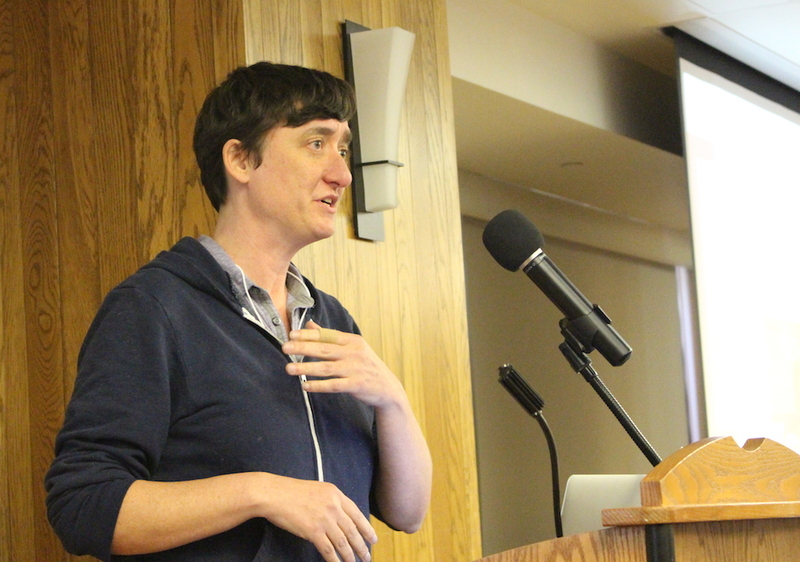 Throughout the day, speakers highlighted cases and examples involving the human rights of Latina, LGBTQ, immigrant, and indigenous women and women of color, who have been the petitioners and advocates behind landmark decisions and advocacy campaigns, such as the case of Karen Atala. Lisa Davis explains Karen Atala’s case before the Inter-American Court of Human Rights. 2014 is a very important year for human rights advocates in the United States. The U.S. just underwent review by the UN Human Rights Committee concerning its implementation of the the International Covenant on Civil and Political Rights (ICCPR), and will soon be evaluated by two other UN human rights treaty bodies regarding its compliance with the International Convention on the Elimination of All Forms of Racial Discrimination (CERD) and the Convention against Torture and Other Cruel, Inhuman or Degrading Treatment or Punishment (CAT). This fall, civil society will prepare its submissions for the Universal Periodic Review (UPR), which the U.S. will undergo in the first half of 2015. Those interested in participating in any of these processes should visit the website of the US Human Rights Network. 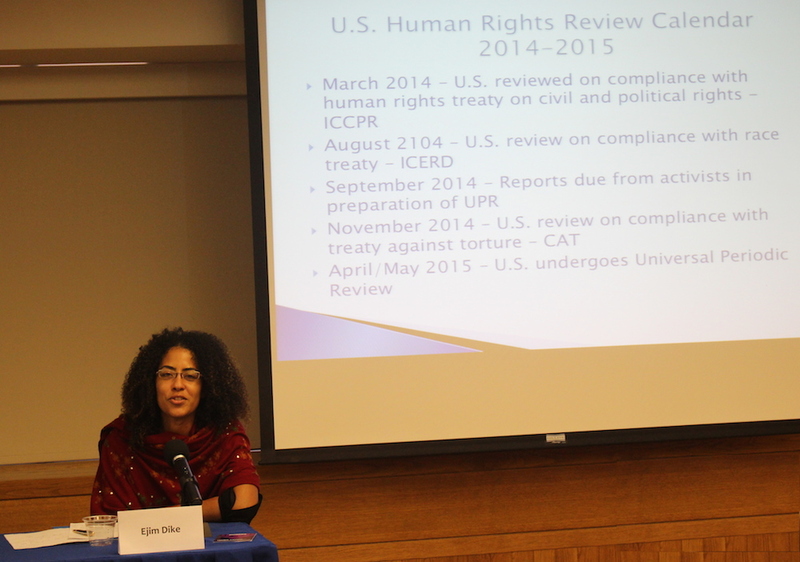 Ejim Dike explains upcoming opportunities for U.S. civil society engagement with UN human rights mechanisms. Videos and additional information on the range of topics addressed during this training will be made available shortly. In the meantime, please visit the Dropbox site to view or download the supplementary training materials.